Walking with Jesus: Day 68: Acts 20:1-6 & Prov. 23:9-18 - What's the Difference Between Courage and Foolishness? Day 68: Acts 20:1-6 & Prov. 23:9-18 - What's the Difference Between Courage and Foolishness? "After the uproar ceased, Paul sent for the disciples, and after encouraging them, he said farewell and departed for Macedonia. When he had gone through those regions and had given them much encouragement, he came to Greece. There he spent three months, and when a plot was made against him by the Jews as he was about to set sail for Syria, he decided to return through Macedonia." What's the Difference Between Courage and Foolishness? The Apostle Paul was no coward. We have seen him face danger and take risks again and again in the book of Acts. He returned to Iconium and to Lystra when they had run him out of town and had stoned him to death. He had been beaten and imprisoned in Philippi and yet did not run away when the jail doors were opened by God in the middle of the night. He faced slander, accusation, intimidation and violence from mobs and corrupt officials again and again. No, the Apostle Paul was no coward, but he was no fool either. After Paul had been in Ephesus for 2 1/2 years, the riotous mobs cued him that it was time to leave. But he didn't sneak away home and quit. He gathered the disciples together and said farewell to them. The number of disciples in Ephesus after 2 1/2 years of Paul's ministry was big enough that this gathering surely drew attention, but it was the right thing to do. Wisdom told Paul it was time to leave, while courage told him to gather the disciples and encourage them before he left. Then, Paul returned to Macedonia, where he had been imprisoned in Philippi and faced other hardships, but where the Lord also had gathered many to Himself. He gave much encouragement to the churches in Macedonia before he came into Greece, probably stopping in Corinth. He remained in Greece for for three months. The best way for Paul to get back home from Greece was to sail. But Paul learned of a plot against his life. 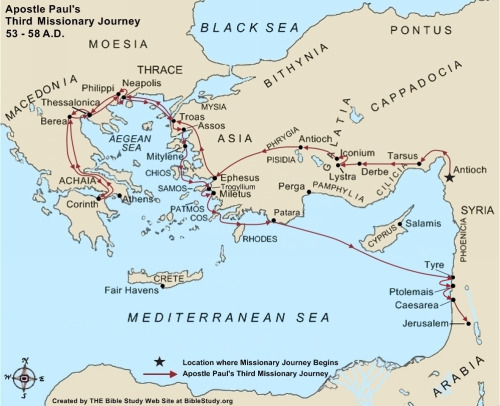 On the waters of the Aegean, Paul was an easy target for would-be Jewish assassins. So wisdom caused Paul to change his plans and double-back through Macedonia before returning finally by ship from Miletus, in Asia Minor. If you look at a map, you get a better sense of how much quicker and easier it would have been to sail from Corinth to Miletus and then from there to Syria. Walking was certainly not the easy route, but it was the wise one. Faithfulness in the Christian life calls for both courage and wisdom. We need discernment to know what the right thing to do is and grace-empowered courage to actually do it. May the Lord be pleased to give us both, that we may follow and serve Him well!